This is not my best Theodore Roosevelt. The colors on the face should contrast a little more and he’s probably a bit too thin. I’ve always loved the presidents and have been doodling the iconic ones — Washington, Lincoln, TR, and Nixon — since I was a kid. I also do a decent W. Drawing Teddy here really makes me want to rework my old comic “The Jaws of Defeat,” which was all about giant, reanimated presidents wreaking havoc on a fractured future USA. Also, the presidents are naked. It was a story I did for an anthology last year and started posting here but never finished. It’s tiny, black and white, and poorly lettered, though, so I’d rather redo it than just put it up as is. Maybe this summer I’ll get around to it. As far as this picture goes, I think it came out OK. I’d been putting it off because Bigfoot kind of bores me. There’s such a consensus on what he looks like that I just didn’t feel free to take too many liberties in designing him. Copying other peoples’ designs is boring. Also, to me at least, drawing apes/ape-like creatures is kind of boring. I don’t know how to vary them. 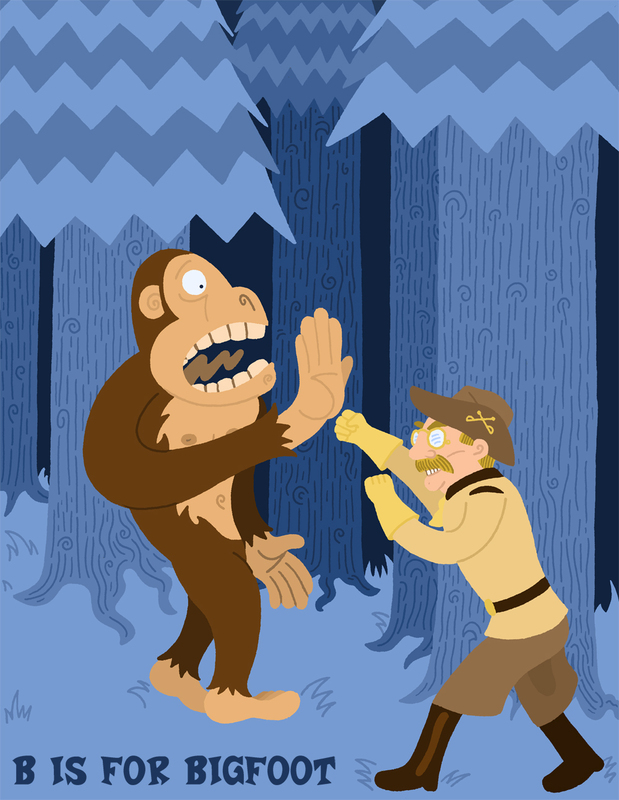 Having already drawn the Humanzee and the Yeti, I felt like I was pretty much out of ape ideas. It wasn’t until I thought of the TR concept that the piece got interesting. Once it did, it came together in a night. Teddy’s definitely the most interesting simian in the picture.